Because you are so emotionally invested in your own writing, it's often best to practice your flaw-finding skills with the work of others. 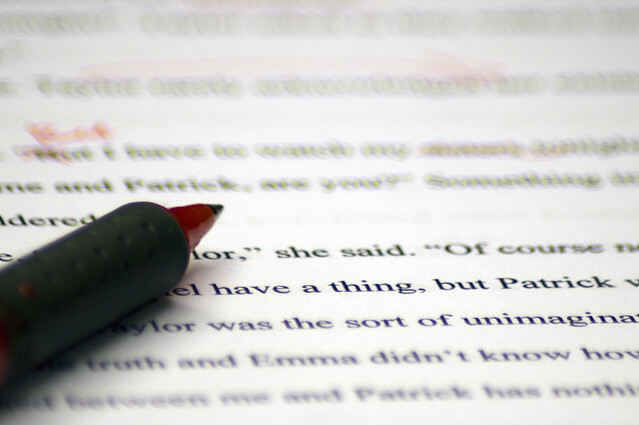 Not only can you bring the full force of your writing knowledge to bear on the essay without fear of making a mortal enemy of a classmate or coworker, it helps ease any guilt you may feel about criticizing someone else's work when that person is a stranger far-removed from your life. The following piece of writing is so full of errors, it's a perfect vehicle for honing your revision and editing skills. To be certain no one is distracted from analyzing the writing itself, I will not reveal the name of the author*. I will say that I found this article in a community college newspaper for which there are no online archives. It was published in February 2011 during a time when society was facing the same issues it faces today with school-related shootings. It will become apparent in the writing that it was written by an English composition instructor. I can't adequately describe how disappointed I am in this quality of writing for someone whose profession it is to teach writing to others, but there may have been reasons of which I am unaware for the caliber of this article's writing (Goodness knows I rush to publish some blog posts at the expense of the writing). At any rate, this article demonstrates that no one is perfect, not even writing instructors. While there are many errors in this short excerpt, I want to focus on its topic sentences. Feel free to try and locate all the errors you can find, though, as it's great practice. I will include a link to a more full commentary of this excerpt's shortcomings at the end of this blog post. Let me know if I've missed any! If I didn't already know it, I would never have guessed that this paragraph was the introductory paragraph. Traditional introductions usually begin by capturing the reader's attention with some sort of “hook” and include a thesis statement that identifies the essay's overall argument (usually located at the end of the paragraph in order to immediately transition to the supporting main points). The preceding paragraph only resembles an introduction in that its elements are in reverse order. The first sentence states the overall topic of the essay and so can be considered a thesis statement. However, its placement at the beginning of the paragraph resembles the way topic sentences are placed at the beginning of body paragraphs, and, while not “incorrect” since this article is not an academic essay, fails to engage and lead the reader towards a point of view the way a conventional introduction would. In fact, the first sentence does nothing to direct the focus of the paragraph onto a single point. The remainder of the paragraph is all over the place! It jumps from Texas to Wisconsin with no background information for readers not up-to-date on current events. Then it jumps back to Texas and an awkward contradiction about whether or not unions exist in the state. I'm having a difficult time figuring out which sentence in the preceding paragraph is the topic sentence because it is as all over the place as the first paragraph. The first sentence is certainly not the topic sentence because the majority of the paragraph is focused on politics, not his or her teaching skills. The ending of the second sentence “will I have to figure out how to handle a situation where a student points a gun at another student when they disagree or break up?” could be the topic sentence, but only the third sentence elaborates on this point. The fourth sentence transitions into a vague statement that is never explained: “In the mean time, I’m going to do something about it.” Because the fourth sentence is clearly a transition to a NEW point, the fifth sentence should be the beginning of a new paragraph. Rather than starting a new paragraph that explains what s/he plans on doing about the situation, the fifth paragraph instead references Wisconsin (again without supplying background information). The author instructs the legislators there not to vote and then berates Texans for the consequences of their failure to vote...without explaining what those consequences were. The remaining sentences are a call to action for students to vote with their “feet” (What does that mean? Is s/he asking for students to stage a campus walk-out?) and their “cell phones.” Calls-to-action belong at the END of essays, where they are more effective. Based on these sentences, I would have thought this paragraph were the concluding paragraph. Despite the sudden shift in person and intrusive phrase “for all our brains,” the first sentence in this paragraph actually does act as the topic sentence. While it does have that strength going for it, the rest of the paragraph could use some reorganization and rewording to make it stronger. For example, “Like our brothers and sisters in Wisconsin, we have to practice what we preach” would be more effective if it preceded the call-to-action “Caravan to Austin with your neighbors, friends, and concerned parents.” Speaking of the call-to-action, it should be the concluding sentence in the paragraph, not “Maybe the pen really is mightier than the sword,” which makes no sense as the author has not mentioned writing as a form of voicing her/his concerns (instead, s/he called on people to “use their feet,” place calls to legislators, and drive to the state capitol). Hopefully looking at a stranger's writing with a critical eye has helped you become aware of the kinds of things readers (e.g., teachers and bosses) look for when judging the work in front of them. There are plenty of other writing mistakes beyond how well each paragraph adhered to its topic sentence (if it had one); I've gone ahead and identified all of these errors in a separate document that you can download from Google Docs. I used endnotes to identify errors so that you could have a chance to figure out what each writing error is before scrolling down to the end of the page to see the answer. Feel free to unleash your writing wrath on this article without fear of alienating someone you have to interact with regularly. I certainly won't tell if you don't! *If you are the author of the article from which I excerpted these paragraphs and would like proper attribution for your writing, please e-mail me and let me know. While I am normally religious about making sure people receive recognition for their work, I feel in this particular case the author may not want the recognition. I agree without critique of the paper. However, you could have been harsher on the paper. The introduction in particular is a sloppy mess of incoherent sentences. Sure, sometimes we have some leeway on how and what to critique on a paper, but being a contributor to the college newspaper, one would expect them to adhere to higher standards of writing. Several proofreading passes maybe be required to convert a bad paper into a great one. Great article!